Here's a Bible story book with a difference! 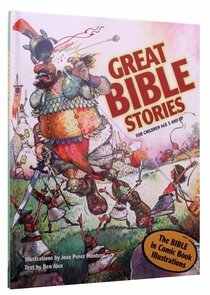 Favourite tales from both testaments are faithfully retold in appealing style, and are acccompanied by lively, quirky, comic book illustrations that really grab kids' attention! This is a book kids will return to again and again. Ages 5-10. Here are all the great Bible stories from Genesis to Revelation - in words and illustrations that children can understand. Author/photographer BEN ALEX grew up in Copenhagen and has been living in the high desert of Oregon for a number of years. He has published nearly 30 books and has received the C.S. Lewis Gold Medal and several graphics awards. 0 Available. Expected to ship in 16 to 20 weeks from Australia.